The LBHS Surf team had a very successful weekend surfing in the NSSA Interscholastic Regional State Championships for the third year in a row. Laguna’s tremendous showing took them all the way to 2nd overall with an 84-point total, just 9 points behind San Clemente. In all there were 10 schools competing. This is the best result for Laguna to date. It was definitely a whole team effort. Laguna was represented in each of the Division Finals. Jameson Roller led the way in Longboard finishing third, Kayla Coscino and Tess Booth both did awesome taking fourth and fifth, while Sam Nelsen won heat after heat dominating the field on Saturday and closed out the Men’s Final for Shortboard in sixth place. The rest of Laguna’s Men Shortboarders did super well also, making several rounds and helping LBHS to its impressive finish. Trey Lockhart and Liam McCue had some outstanding performances barely coming up short of advancement in the Quarterfinals. Meanwhile there was great surfing and efforts also put in by Kiko Nelsen, Jett Nelson, and Kyle Shaw. The event was held at Seaside Reef at Cardiff-by-the-Sea in San Diego. Surf on Saturday was pretty good in the morning, but got progressively worse as the day went on. The weather was pretty bad with plenty of rain and some wind. Sunday afternoon prior to the Finals there was more wind and rain, but the kids still managed to navigate the conditions very well. The LBHS Boys Tennis team had a very busy first week back from Ski Week with four back-to-back matches. The first opponent they faced was a mighty Aliso Niguel squad, resulting in a 7-11 loss in a match where three of the sets lost were in tiebreaks. This match easily could have gone to the Breakers, and Coach Rick Conkey was pleased with the depth of his Breakers team. Senior Mason Lebby won two sets at #1 singles (6-4, 6-3) but fell against Aliso Niguel’s #2 singles in a tiebreak. Junior Andrew Johnson notched a set at #2 singles and lost a tight set against Aliso Niguel’s #3 singles in a tiebreak. Sophomores Casey Boehm and Matthew Duong teamed up at #2 doubles to secure two sets (7-5, 6-2) but lost against Aliso Viejo’s #2 doubles team in a tiebreak. Kyle Herkins and Matt Berk paired up at #1 doubles to get a set (6-2) and seniors Scott Yoder and Francis Pillsbury also notched a set (6-3). Wednesday’s opponent was Mission Viejo High School, resulting in an 11-7 victory for the Breakers. Coach Conkey was impressed with the tenacious and gritty play of doubles duo Casey Boehm and Matthew Duong, who won all three of their sets at #2 doubles (7-5, 6-3, 7-5). In the final set, Matthew came down with severe leg cramps – he found a way to dig deep to overcome his body and tough opponents and Casey was awesome as a supportive partner. Kyle Herkins and doubles partner Matt Berk won two of their sets (6-3, 6-3) at #1 doubles. Singles players Mason Lebby won two sets (6-2, 6-2) at #1 singles and freshman Ian MacLaughlin also notched two key sets (7-5, 6-2) at #3 singles. Scott Yoder and Francis Pillsbury added a set (6-4) at #3 doubles as did Andrew Johnson (6-2) at #2 singles. The closest match of the week was against St. Margaret’s Episcopal School, who lost in the second round of the CIF Division 2 playoffs last year. This match was a nail-biter until the last two sets of doubles, both lost in tiebreaks. If either set had gone to the Breakers, the score would have been tied 9-9 and the Breakers would have won in games. That was not in the cards as the Breakers lost 8-10. #2 doubles Kyle Herkins and Mo Berri won twice (6-4, 6-1) as did the #3 doubles team of Scott Yoder and Andrew Duong (6-4, 6-3). Casey Boehm and Matthew Duong had a win at #1 doubles (6-2). All three Breakers singles players (Mason Lebby, Andrew Johnson, and Ian MacLaughlin) won a set each (6-0, 6-1, 6-0, respectively). Friday’s match against Laguna Hills High School resulted in dominance by the Breakers’ doubles teams as they swept in doubles, winning all 9 sets with four of the sets scoring 6-0 for the Breakers, and the Breakers winning 12-6. Coach Conkey relied on the depth of his doubles players, with Taylor Tran and Diego Tellez also seeing a lot of court time. The boys rested over the rain filled weekend ready to take on their next opponents before league play begins later next week. State Superintendent of Public Instruction Tony Thurmond recently announced that Thurston Middle School is among the 162 middle and high schools honored under the 2019 Distinguished Schools Program. Sponsored by the California Department of Education and California Casualty, the program recognizes outstanding education programs and practices. Schools are awarded for achieving exceptional student performance for two consecutive school years or closing the achievement gap between two school years. Thurston Middle School was recognized for its exemplary programs focused on increasing student academic achievement and social-emotional strength through collaboration, critical thinking, creativity, and communication. “When a child feels connected and cared for in their school environment, they are better equipped for the academic rigors of school,” said Thurston Middle School Principal Jenny Salberg. “Because we believe this to be most vital during the middle school years, our staff focus on developing and maintaining positive relationships with students. They work tirelessly to build meaningful connections with each student, and we see the fruits of their labor every time we witness a student overcome a challenge to continue on their path to success,” she continued. In recent years, Thurston Middle School has implemented programs such as Where Everybody Belongs (WEB), No Place for Hate®, Restorative Justice, and a Co-Vitality Social-Emotional Health Survey, which helps identify students who are struggling emotionally. Schools that applied were eligible based on their performance and progress on the state indicators as described on the California School Dashboard. Indicators include test scores, suspension rates, and graduation rates. Distinguished School award winners represent examples of not just excellent teaching, learning, and collaboration, but also highly successful school climate efforts ranging from real-time conflict resolution to positive behavior intervention. The Laguna Beach Unified School District Board of Education will recognize Thurston Middle School at an upcoming Board meeting. This year’s award-winning schools and districts will be honored by the California Department of Education in April during a ceremony at the Disneyland Hotel in Anaheim, and they will retain their titles for two years. Elementary and secondary schools are awarded in alternating years. Thurston Middle School is located at 2100 Park Ave.
One of the most enduring shows of all time, Joseph and the Amazing Technicolor Dreamcoat will be performed by the Laguna Beach High School Drama Department and Park Avenue Players on March 15-17 and March 22-24 at The Artists Theatre at LBHS. The Friday and Saturday shows start at 7 p.m. and the Sunday shows begin at 2:30 p.m.
Joseph and the Amazing Technicolor Dreamcoat is a musical with lyrics by Tim Rice and music by Andrew Lloyd Webber. The story is based on the “coat of many colors” from the Bible’s Book of Genesis. This was the first Lloyd Webber and Rice musical to be performed publicly. (The Likes of Us, written in 1965, was not performed until 2005). Joseph and the Amazing Technicolor Dreamcoat is a reimagining of the Biblical story of Joseph, his father Jacob, eleven brothers, and the coat of many colors. Tickets are on sale now and are $12 for students, $17 for adults, or $22 for premium seats. To book, go to lbhs.booktix.com. The Artists Theatre at LBHS is located at 625 Park Ave. The Laguna Beach Girls Water Polo team captured the championship title at the D1 CIFSS finals in Irvine on Saturday, defeating Corona del Mar 9-8 in a thrilling 3 OT match. The number one seeded Breakers girls, led by Coach Ethan Damato, will now take on eighth-seeded San Clemente High School on Friday, Feb 22 at 4:20 p.m. at Segerstom High School in the 2019 CIF SoCal Girls Water Polo Championships – Division I tournament. A new mark was made in the 75-year history of Scouting in Laguna Beach on Sunday when ten girls received the city’s first charter for a troop for girls from the Boy Scouts of America. The girls all have the aim of becoming Eagle Scouts – among the first females who will reach this accomplishment in the movement’s 109-year history. The troop of girls will share the Troop 35 number with the 75-year-old troop of boys, also chartered to Laguna Presbyterian Church, but programming, meetings, and camping will be separate, as guided by the program of the parent organization, the Boy Scouts of America. “Since I was little, I saw my brothers having so much fun going camping, doing archery, and climbing rock walls, and now, I can do the same and work my way toward becoming an Eagle Scout, just like my older brother,” said Ani Hovanesian, one of the new Scouts. She and her nine fellow Scouts will take their first official Scout camping trip on March 14 in the Cleveland National Forest. Boys and girls from kindergarten through age 17 may join Scouts BSA. To learn more about Scouting in Laguna Beach, visit www.lagunabeach35.mytroop.us for boys and girls aged 11-17 and www.lagunabeach35.mypack.us for boys and girls in kindergarten through 5th grade. 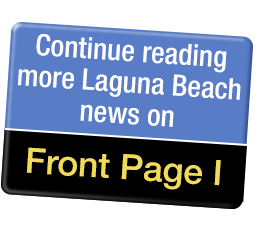 The Laguna Beach School Board will discuss at tonight’s meeting changes to its policies and by-laws that were first discussed at a special meeting on February 6. District Superintendent Jason Viloria recommended a first reading by the Board of Education of by-laws and policies recommended by the board to move forward for addition, deletion, or revision, according to the agenda. The board may waive a second reading or require an additional reading if necessary. Possible violations of the by-laws pertaining to chairing the board were brought to the attention of board members James Kelly, Jan Vickers, Peggy Wolff and newly re-elected Carol Normandin and Dee Perry. “The board shall hold an annual organizational meeting. At that meeting, the board shall each year elect one of its members to be clerk. The board is proposing to drop from the by-laws the order of appointment and the intent for all board members to rotate though the sequence. It has been noted that Perry was twice bypassed for appointment. The discussion is scheduled as the 24th item on the agenda. The public meeting begins at 6 p.m., preceded by a closed session at 4:30 p.m. The sixth grade Laguna Beach Basketball team just won the NJB Championship on Sunday. They beat Anaheim Hills in the finals 40-28. The U14 Girls division of AYSO Region 86 - Laguna Beach won the Section 11 Tournament this weekend held in Santee, CA. After winning the South Orange County Area L tournament back in December, the team advanced to the Section 11 tournament, which was comprised off all area tournament winners from San Diego, Orange, and southern Los Angeles counties. The team will represent the Southern California Section in the Western States Championships scheduled for March 16 at the Lake Forest Sports Park. They will be facing winning AYSO squads from Washington, Oregon, Nevada, and Northern California.